THE Copperbelt University Students Union (COBUSU) says the class boycott by Copperbelt University (CBU) students, which entered the third day yesterday, will continue until Government increases their allowances and begins construction of hostels to ease the accommodation crisis. The university students are pressuring government to increase their meal, book and accommodation allowances by 45 percent. COBUSU secretary general Humphrey Mwenya said in an interview in Kitwe yesterday that the boycott will go on until the demands are addressed by the government. “We shall not resume classes until the students’ concerns are addressed. The students want the allowances increased by 45 per cent and hostels to be constructed. “We have an allocation in the budget for hostels construction but we wonder what is happening,” Mr Mwenya said. He said that the COBUSU executive committee was late yesterday expected to meet Ministry of Education permanent secretary Patrick Nkanza while another meeting with the minister is scheduled for Monday. 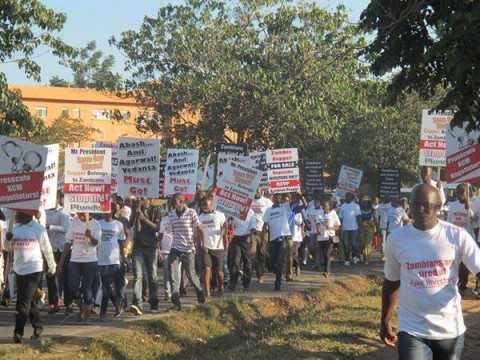 COBUSU president Kingsley Chinyama and academic secretary Muselo Mumba are on an almost 400 kilometre walk from Kitwe to Lusaka to present the student’s concerns to Government.